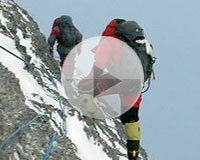 The Beijing Olympic flame reached the top of Mt. Qomolangma at 9:18 am Beijing time Thursday. 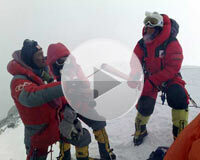 The last of the five torchbearers, Cering Wangmo, hoisted the sacred flame at the world´s highest summit. The relay on Mt. Qomolangma started with female climber Gyigyias the first bearer and Wang Yongfeng as the second. The Beijing Olympic torch was ignited by Norbu Zhamdu at 9:12 am local time on Mt. Qomolangma on Thursday. A 30-meter relay on the world´s highest peak has started with female climber Gyigyi as the first bearer and Wang Yongfeng as the second.